“The rich are getting richer,” declared Russell Flannery, the bureau chief for Forbes Shanghai. The US magazine unveiled its annual China rich list last week, once again showing a marked growth in the ranks of the ultra-wealthy under the policies of China’s nominally ‘communist’ (CCP) dictatorship. The list underlines the staggering wealth gap in China today. The list shows that the country’s 400 wealthiest tycoons increased their wealth by 150 billion US dollars; that’s more than the GDP of seven provinces (Xinjiang, Guizhou, Gansu, Hainan, Ningxia, Qinghai, Tibet). 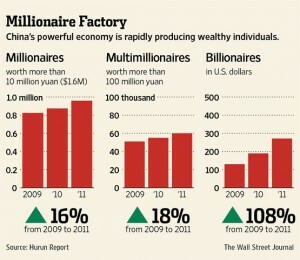 Flannery said China had “one of the world’s fastest-growing number of billionaires in the past decade”. The net assets of China’s 100 richest people jumped 44 per cent from a year earlier to US$316 billion (1.9 trillion yuan) according to Forbes, while its count of dollar billionaires in China rose to a record high of 168 (146 in 2011). Shanghai-based Hurun, which published its annual rich list on 11 September, arrived at a higher figure of 315 dollar billionaires (up from 251 in 2012). According to both lists, China is second to the United States in the number of billionaires. Both lists probably understate the true accumulation of wealth by China’s elite as they must be wary of angering the lordly princelings – descendants of top CCP leaders – who have a tight grip over China’s state and economy. 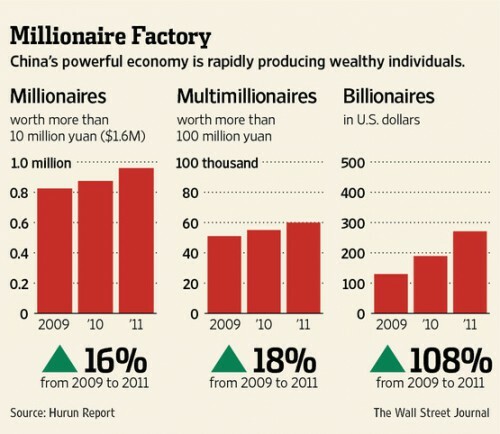 The Hurun list estimated that one quarter of China’s billionaires are members of the CCP. “The rapid growth of wealth in China seems to be out of line with the Chinese economic slowdown,” noted Flannery of Forbes. China’s economy has slowed markedly in the past two years, with this year’s projected GDP growth of 7.5 per cent making for the worst performance in 23 years. This is the official story, while real GDP could be considerably lower – perhaps 4 percent – which represents a severe slowdown for the Chinese economy. While the property sector is still booming, fattening the bank accounts of several of the listed billionaires, workers and the poor are experiencing tougher times with a wave of factory closures, unpaid wages and a pick up in food prices. Forbes list is topped by Wang Jianlin, the owner of Wanda Group, a massive real estate and entertainment conglomerate which last year acquired US cinema chain AMC Entertainment. Wang was valued at US$14.1 billion (86 billion yuan). 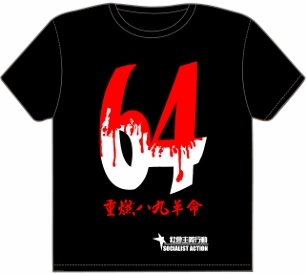 Wang was also ranked first by the Hurun Report. Drinks tycoon Zong Qinghou fell to second place in the Forbes list despite his fortune rising 12 per cent to US$ 11.2 billion. Yet for the 650 million strong rural population average per capita income was just 7,917 yuan last year, or 1,300 US dollars. That amounts to a little over US$3.50 a day to live on – and that’s the average, with tens of millions living below this level. The extreme wealth gap in China, topped only by a handful of countries in sub-Saharan Africa, is a time bomb. In an online poll by China Youth Daily last year, 75 percent said the “huge income disparity” was the most serious problem in society. During the three-decades-long process of capitalist restoration in China, the CCP dictatorship has integrated the new capitalist elite into its structures, as shown by the presence as ‘lawmakers’ of so many billionaires as well as ‘mere’ millionaires at the annual sessions of the rubber stamp National People’s Congress (31 billionaires took part in 2013) and Chinese People’s Political Consultative Conference (52 billionaires took part in 2013). Zong, number two on Forbes list, is a National People’s Congress deputy, while Wang, the list’s number one, is a member of the CPPCC’s standing committee. 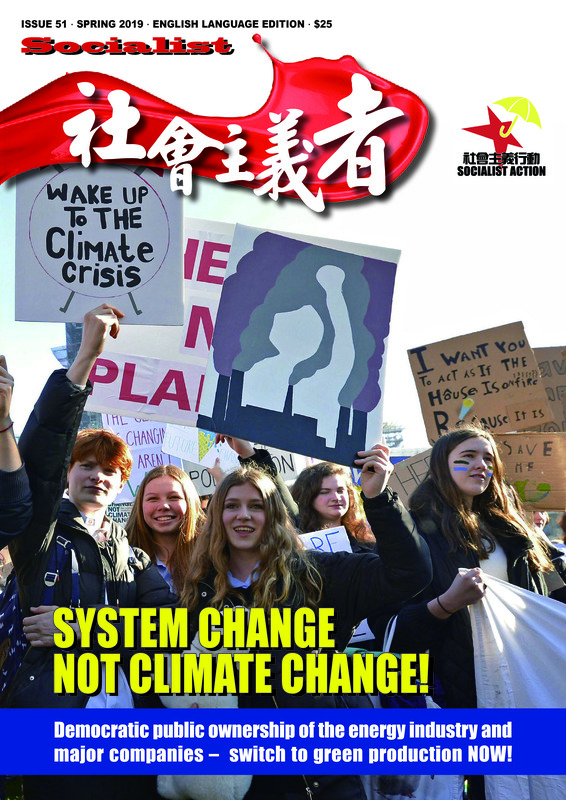 The ever tighter embrace of the CCP and the billionaire elite, while living standards for the masses are squeezed by the global capitalist crisis, is preparing an explosion of popular anger in the coming period. 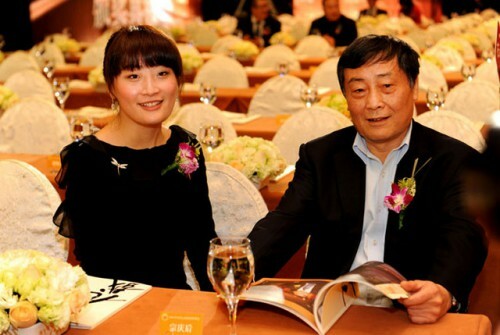 Zong Qinghou says daughter Kelly Zong, a US citizen, will take over Wahaha when he retires.